Hotel pick-up at 7:00-8:00am. The guide will wait you at the hotel lobby, by holding a paper sign with your name on for you to recognize. It is so pleasant to spend the morning at Mutianyu Great Wall to enjoy its spectacular scenery. Take a simple Chinese lunch and then move on the Dingling undergroud palace of Ming Tombs. *During the trip, 1 or 2 short visits to handcraft factories will be arranged. *Our English-speaking guide will call you at hotel at around 9:00pm on the day before your tour to inform you the exact pick-up time. If you’re not at hotel, the guide will leave you a message at the front desk. 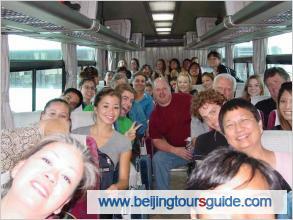 *English-speaking tour guide and vehicle for transfers & sightseeing.